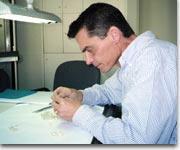 GIA Gemologist, 33 years experience in all phases of jewelry repair and stone setting. Rob is a third generation jeweler and craftsman at Bowman Jewelers. Linda is certified in Diamond grading for GIA in California. She travels twice a year to Antwerp, Belgium, the diamond cutting capital of the world, to eliminate the middle man and save you money on your purchase. Feel free to call her with your questions for her guidance on you upcoming purchases. Be it first time engagement or that big anniversary or any occasion in between nothing makes come see her first. Linda is part of the third generation of Jewelers here at Bowman's .She and her brother Rob and the current owners and both have been in the jewelry business for over 30 years.